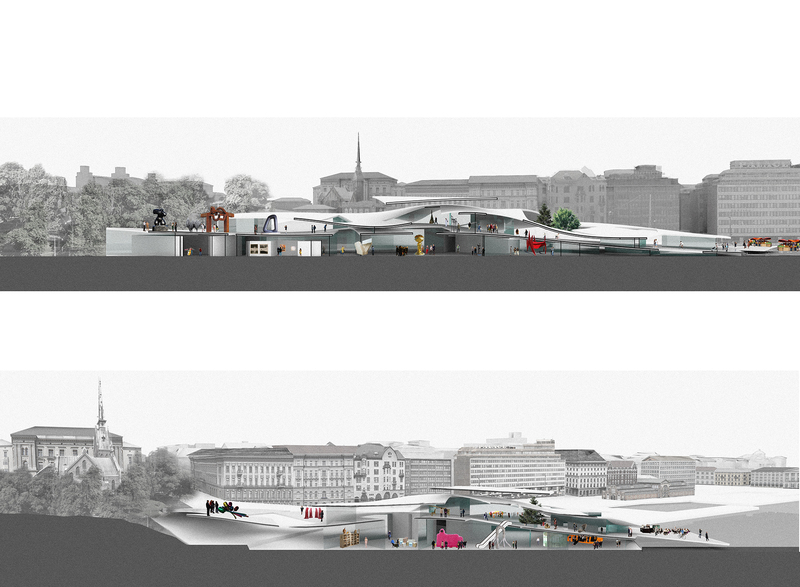 In a city rich with museums and a culture of design the addition of a new art museum requires special attention. 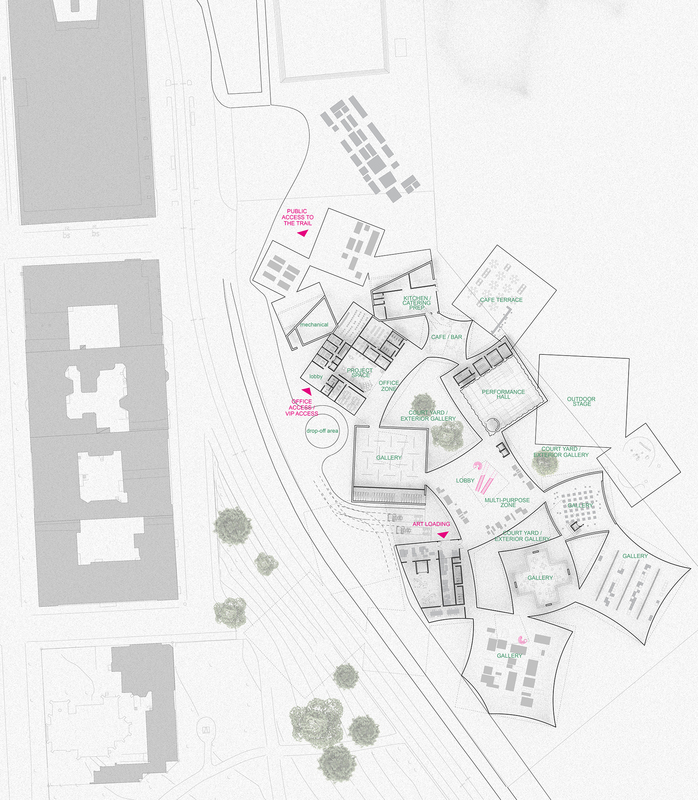 Slightly distanced from the existing art district, the proposed location suggests a direction that is unique, and likewise implies a character for the building that would set it apart not only in Helsinki but in the world. Urbanistically it also offers an opportunity to firmly connect the city with the waterfront and its activities. 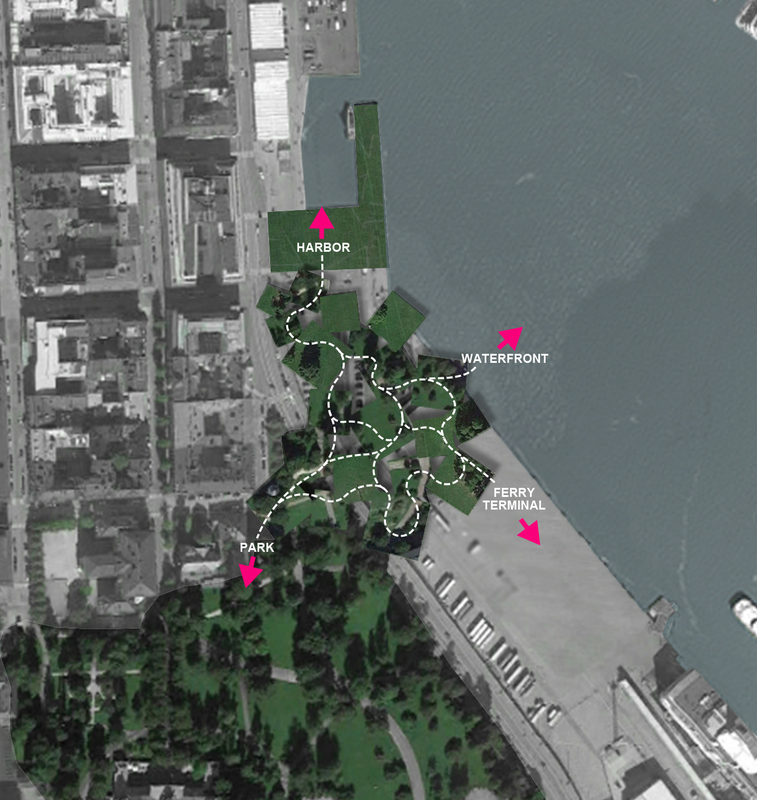 The proposed site on the waterfront lays between the city and the ocean on a strip of land that is defined firstly by its lack of definition, and secondly by the breadth of activities that such a circumstance allows. 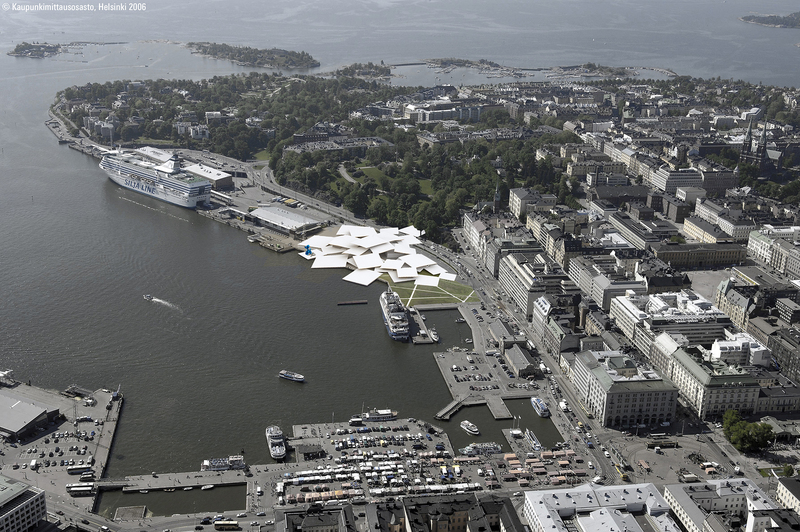 While the center of Helsinki might be viewed as a particularly rational urban enclave, the waterfront is its opposite. Roads, plazas, parking, and the functions of a working harbor are spatially indistinguishable from one another, creating a place that takes its character from its visitors and its inhabitants rather than from the sparse buildings that occupy it. It is a site under constant revision, with ships moving in and out, disgorging and boarding hundreds of people at a time, none of whom stay for long. 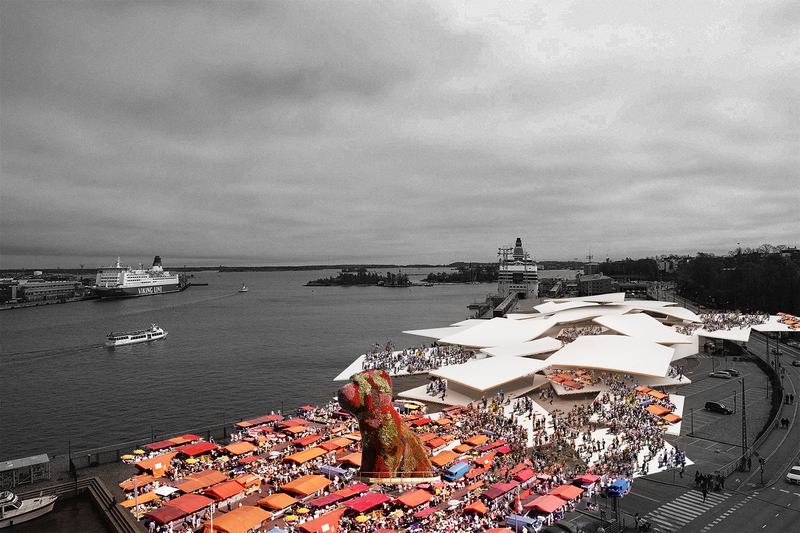 The market in Kauppatori square is similarly lite in presence, but together these activities generate a kind of temporal typology that is essential as a counterweight for the city as a whole and should be preserved. 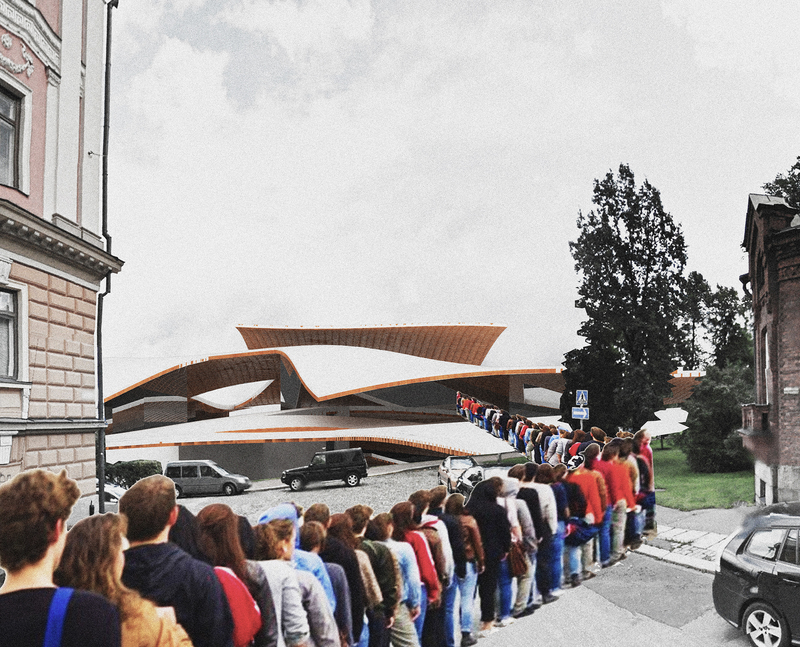 Building on this site will create a permanence that does not now exist, and as such the challenge is to make a museum that puts transformation at its core, along with the ambitions of the art that it will hold and display. What is needed is a building that is as least like a building as possible, but still functions as a platform for some of the best examples of art in the world. On the surface this might seem a contradiction, but in fact both needs are pointed in the same direction. 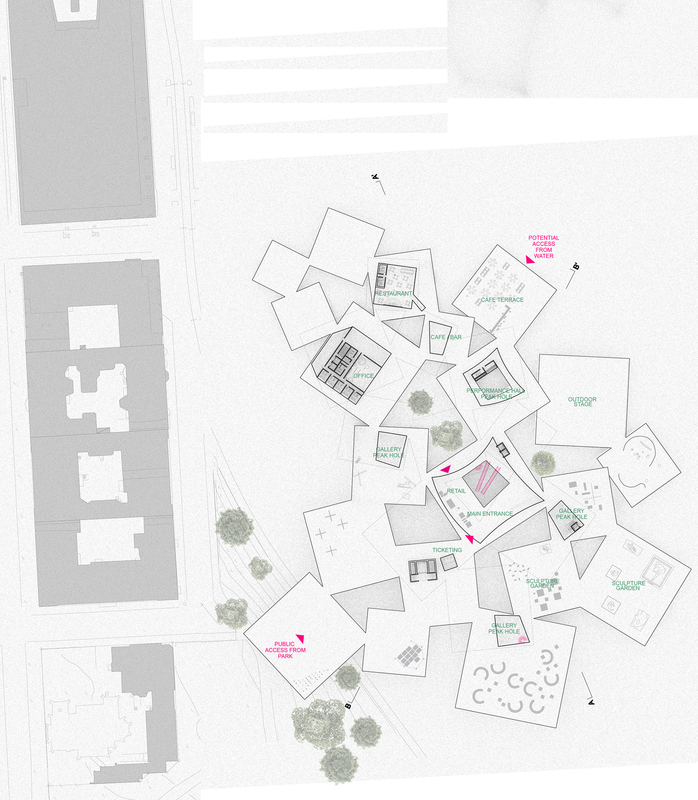 Our proposal is to build a museum that is at ease with change and with impermanence. It connects the city with the water through a landscape as large as the site itself, and is built up from small pieces to form a landmark building that takes its impact from its connectivity more than from a sense of control. Novel experiences prevail over novel form. Kept low in profile it is a stealthy addition to the harbor and does not take away from the existing views. On the other hand the breadth of experiences that it allows on the site is entirely new for a cultural building. If art is about human thought and action, this building reflects that potential and asks the city, the artists and the curators to act together to define the role of art in our time, and is designed to encourage experimentation and interaction. In this sense it is a democratic model in the most radical definition of the term. It is a democracy of plurality. Plurality of experience, plurality of people, plurality of place, plurality of art. In the 21st century all art is possible, from video, to performance, and painting to sculpture. 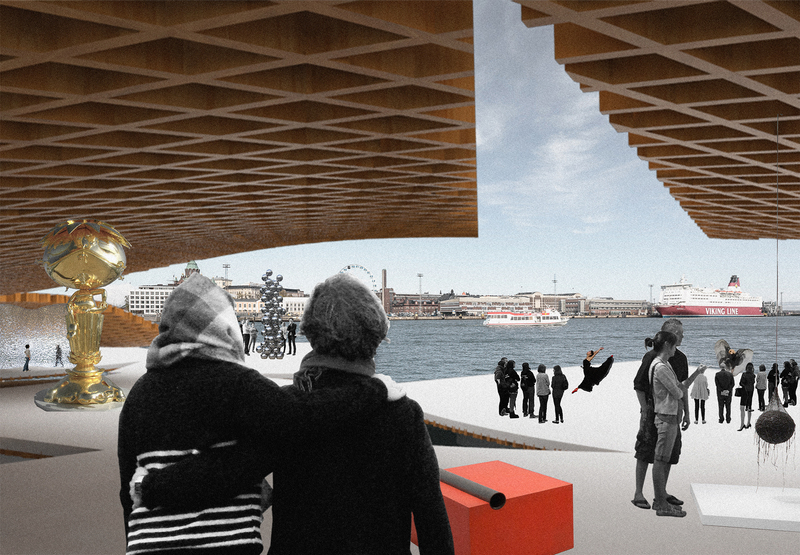 Here these sides of creation are used actively to bring people together and to support community, making the Guggenheim museum in Helsinki a place of immense potential.